Made our break more enjoyable knowing how easy it was to park and leave. Located just five minutes from Terminal 5, Good To Go Park & Ride T5 offers a budget-friendly, yet convenient solution for all travellers flying from Heathrow. Simply drive to the car park, find a space and hop on one of the regular free transfer buses. Use the free orange Long Stay buses, which depart every 5-10 minutes and take just five minutes to reach Terminal 5. Use the intercom to call for a bus between 23:30-05:30. 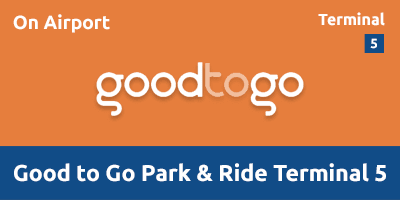 Good To Go Park & Ride T5 has staff on-site 24 hours a day, CCTV coverage, entry and exit barriers, security fencing and frequent patrols. The car park is a recipient of the police-approved Park Mark Safer Parking Award. Parking bays for Blue Badge holders are situated in Zone B. Wheelchair access is available on all courtesy coaches. This car park opens at 05:00 and operates 365 days a year. Leave at Junction 14 and follow signs for Terminal 5 and Heahtrow Long Stay T5 Car Park. At the Terminal 5 roundabout take the first exit on to Western Perimeter Road. Proceed through a set of traffic lights and mini-roundabout onto Northern Perimeter Road. Heathrow Long Stay T5 Car Park is on the right after the car rental returns area. If using a sat-nav please use: TW6 2RL and follow signs for "Long Stay T5 Car Park"
Drive up to the entry barrier and a ticket will be issued with your registration and booking reference. Don’t push the button for a ticket unless one is not automatically issued. Take the ticket, enter the car park and drive to the zone indicated after the entrance. On your return, head to Bus Stop 21 outside arrivals and jump on a shuttle back to the car park. Once at the car park, return to your car and drive to the exit barrier. The barrier will rise allowing you to leave the car park. If the ticket failed to print your booking reference, please visit the Customer Service office by the exit. In the event of any problems, one of the car park’s 24-hour staff will be pleased to assist.